Conny is a watercolour artist that produces paintings from her home studio. She shows and sells her work independently as well as part of the Riverview Artists collective and the Calgary Artists Society. Conny paints with both watercolour and acrylic, but particularly enjoys the technical challenges that watercolour offers. 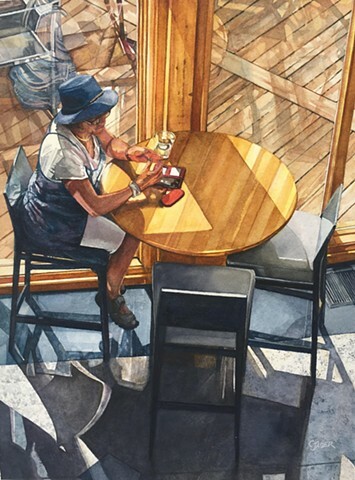 She finds solace in details and chooses images from her travels that have repetition of form, reflections in glass or water, perspective elements, texture, light, and shadow. These are some of the foundations of all art and Conny likes the purity and honesty they give to her work. Her images are based on her own photography. Looking through her Gallery, Conny has grouped her images into series of works, but some images, like this one, called "A Gathering Place" bridge several images together and culminate the skills and styles and colours and subject of more than one series. Conny wants you to stop and take a walk through her paintings. If you have any comments or questions, please go to the contact section as Conny would love to hear your feedback on both her artwork and her new website.